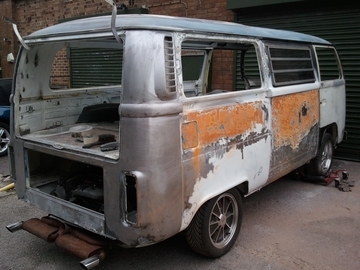 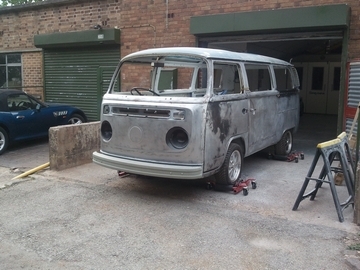 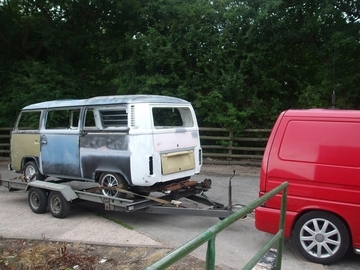 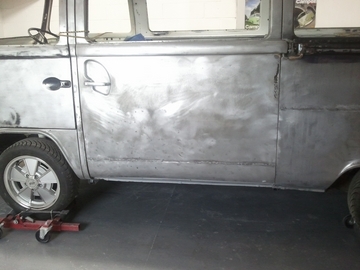 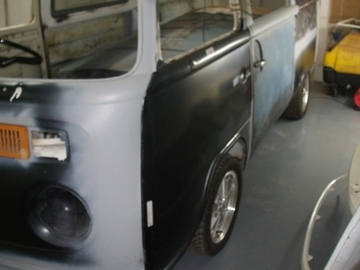 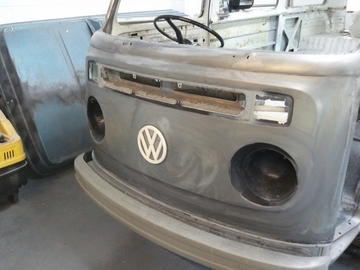 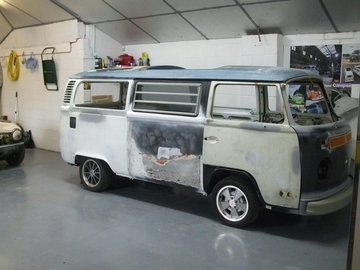 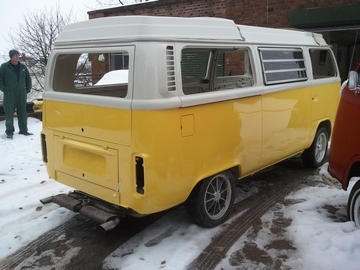 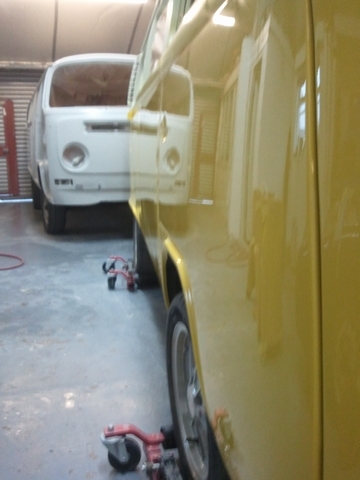 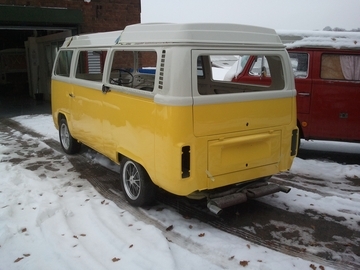 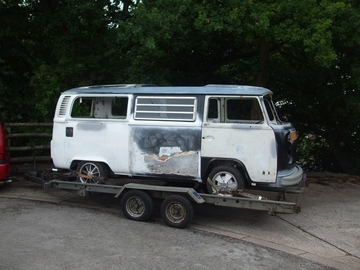 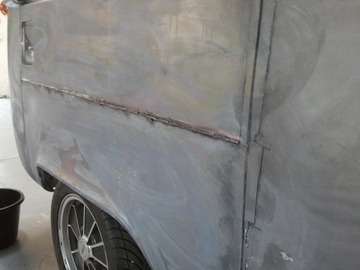 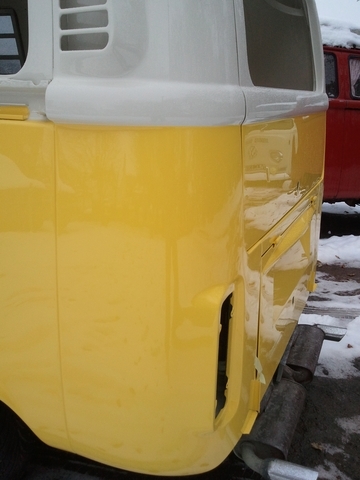 This Westy is in for a full bare metal Re paint. 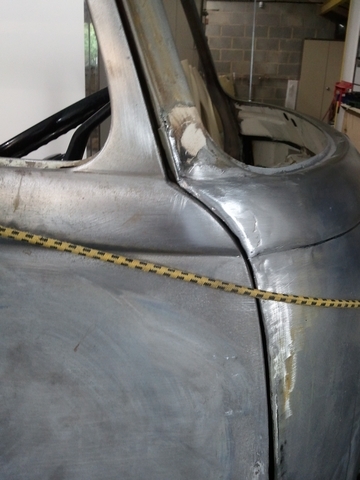 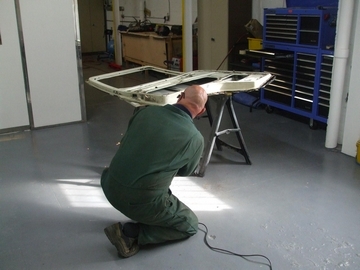 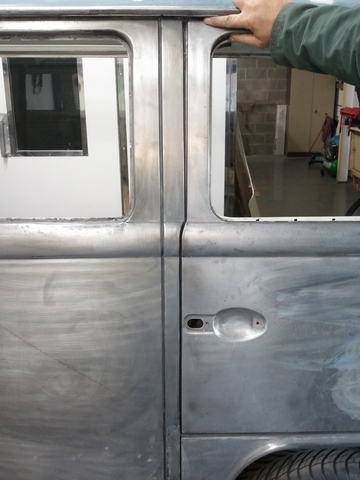 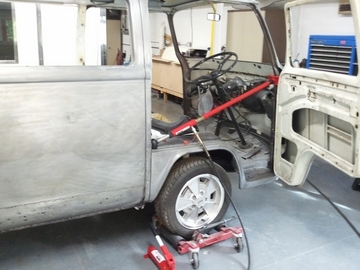 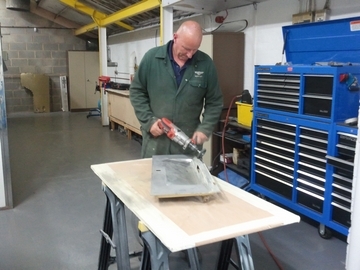 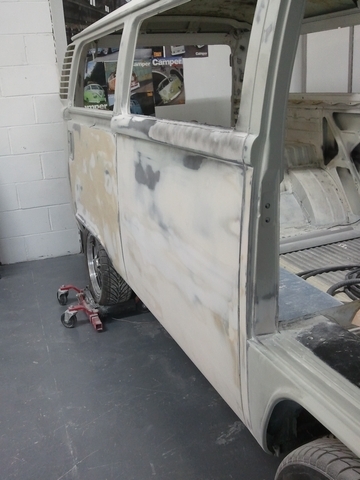 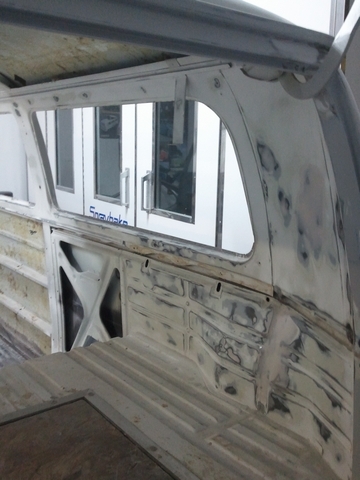 We have got to carry out the body repairs, minor welding where needed, Re skin a door and give it a full hit in White over Yellow, Heres how we got it after Simon and hannah have replaced some of the panels . 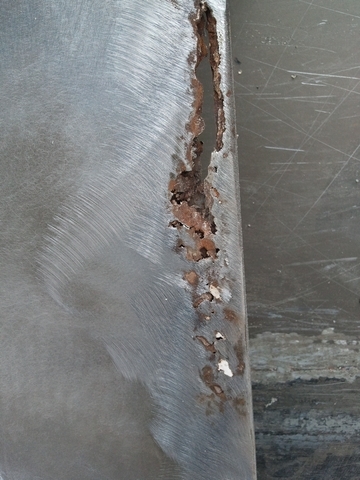 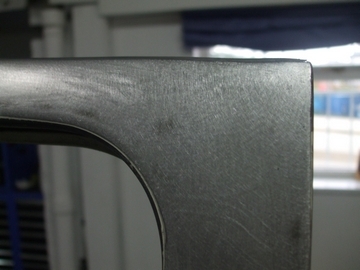 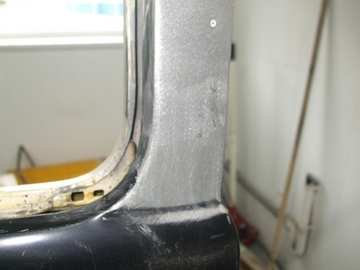 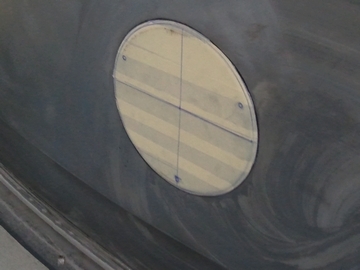 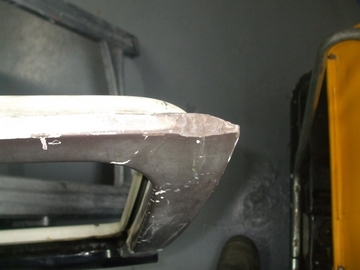 Door skin off and has revealed slight corrosion along the bottom edge. 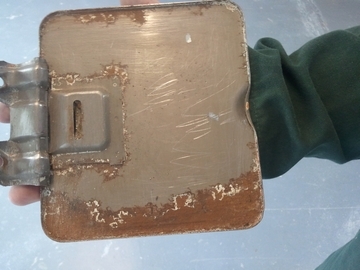 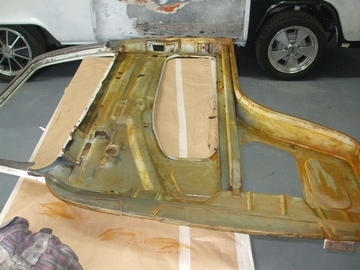 We will Remove this, coat it with dinatrol rc900 and give it a coat of acid etch before re assembled. 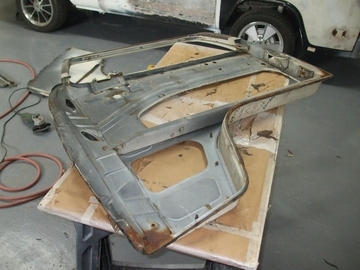 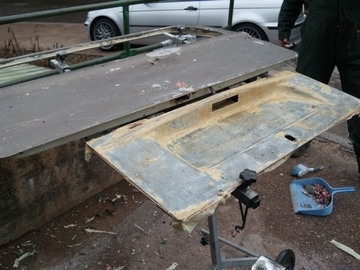 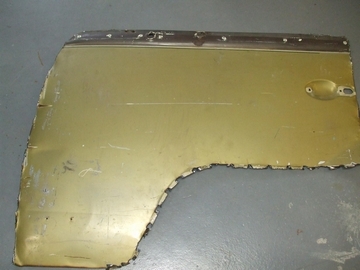 The old frame removed and place in the new skin! 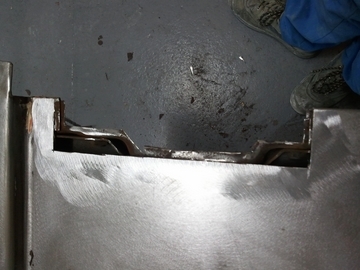 Here we have sealed the skin to the frame to keep them close together and stiff, which will stop moisture and further corrosion getting between them. 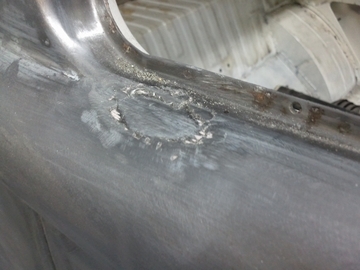 Skin on and Welded up after lots of nocking and pulling to get it to fit. 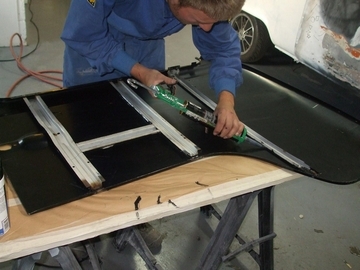 We started to adress why the doors werent fitting right and it seems the repoduction front panel was poor quality. 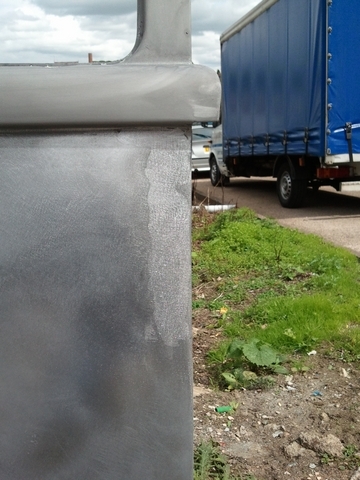 Here We have started to lead load the gaps and shape the contour as its on the corner lead will be stronger than filler. 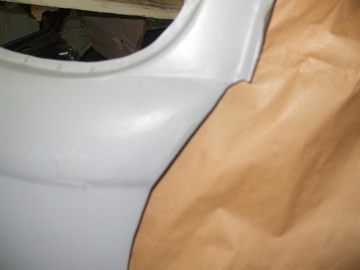 Outer skin cut to shape and folded around the edge and over the inner skin to match the original shape. 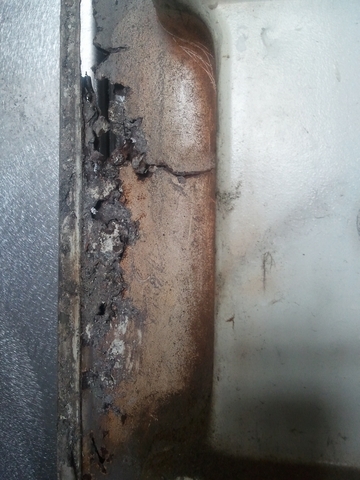 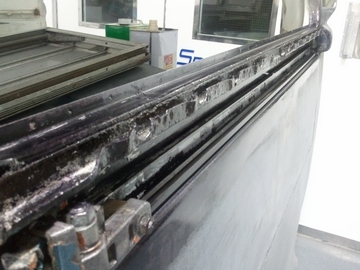 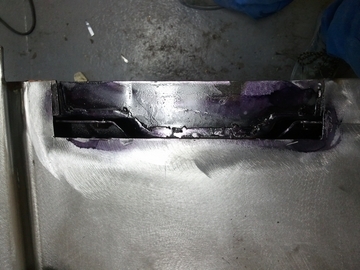 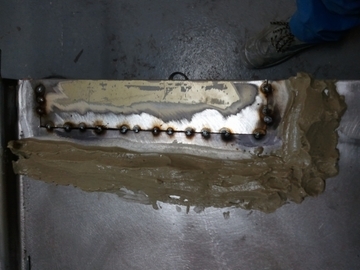 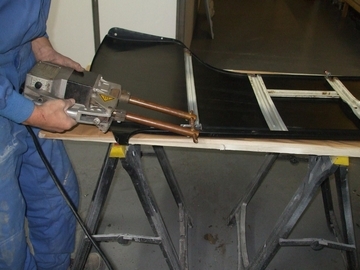 The gooey stuff is Cold front which stops heat travelling through the panel, This is now ready for fully welding. 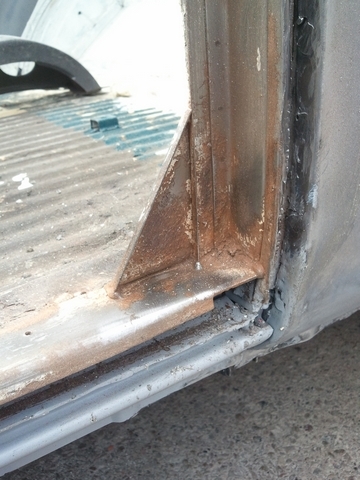 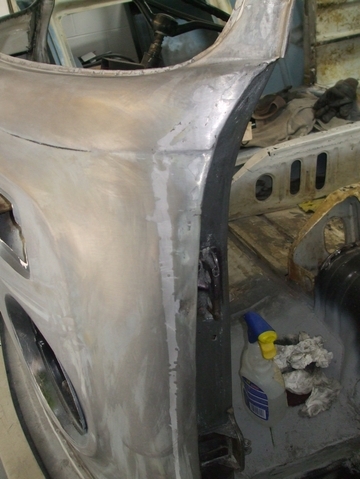 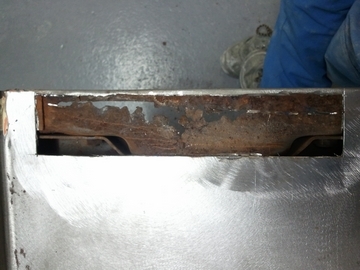 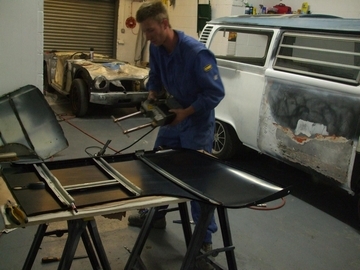 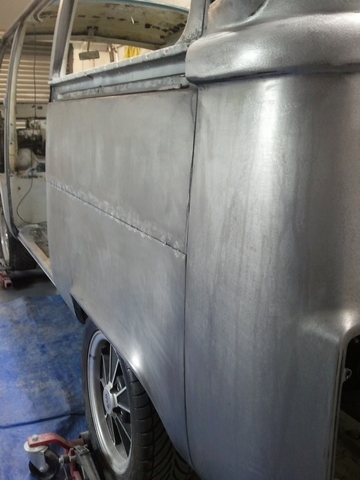 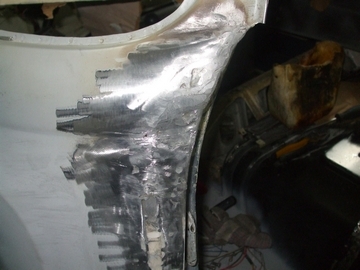 Welded in and lead loaded so little filler is needed to smooth into the panel. 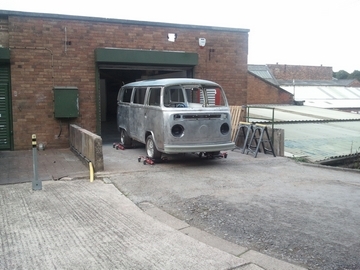 More pics to follow !!!! 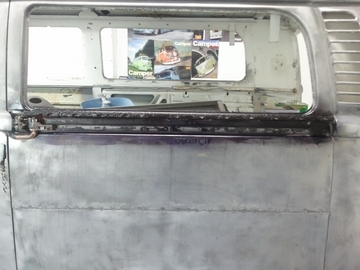 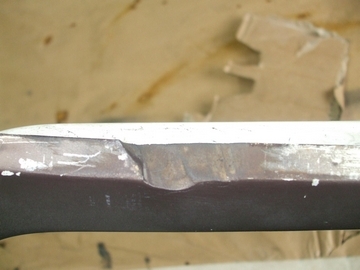 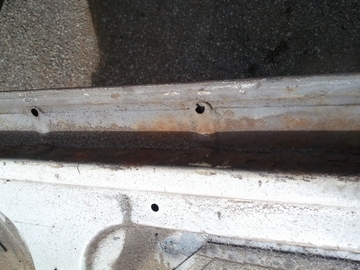 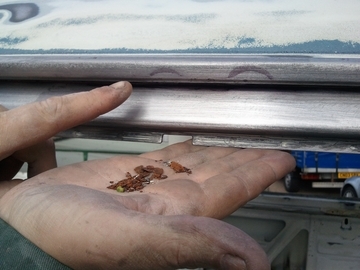 Inside the bottom edge of the sliding door before treatment. 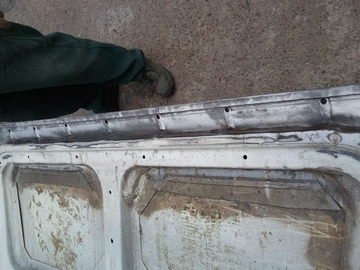 Today we have strengthened the roof with heat shrinking as it was very weak due to a spare wheel being repeatidly thrown on top ! 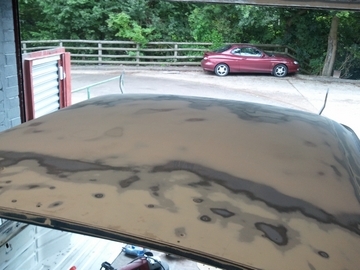 After We dealt with the weak roof we started to deal with the big creases. 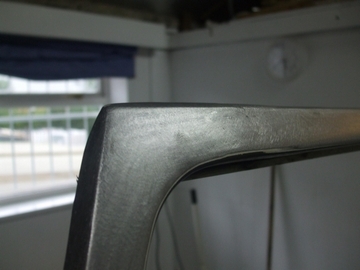 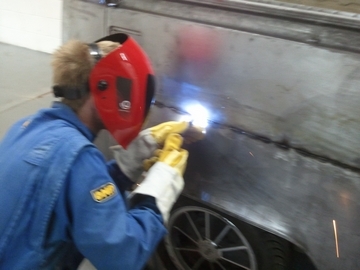 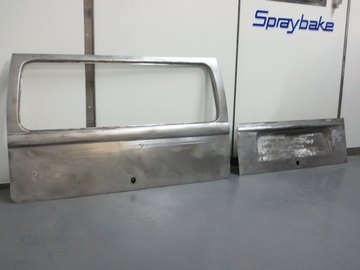 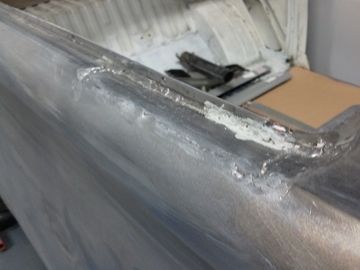 We also have started to deal with the larger dents,creases and finish some parts of welding to get it ready for its second stage of protection. 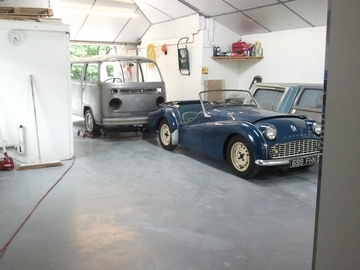 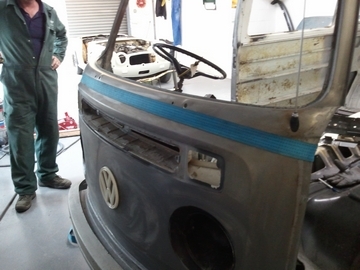 Some of the larger Repairs sorted, Now awaiting minor repairs to be completed. 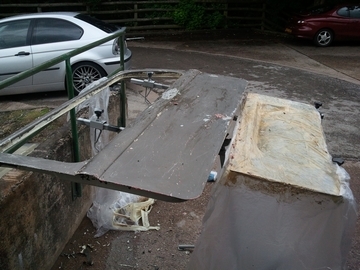 Panels cleaned ready for the third stage of protection. 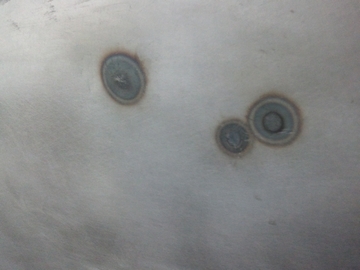 We have also been heat shrinking some of the oil canning pannels. 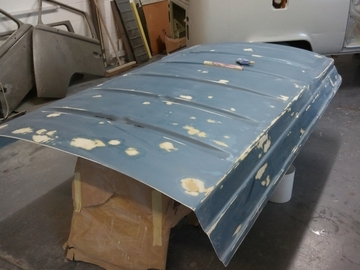 Here we have been leveling the sides as they were badly rippled almost corrugated, the most hard and time consuming bit so far !! 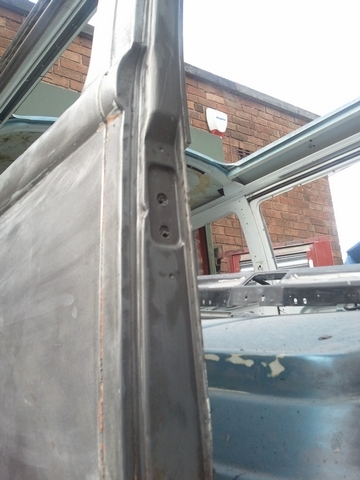 Doors strectched atleast an inch using lead at the bottom to get a better gap ! 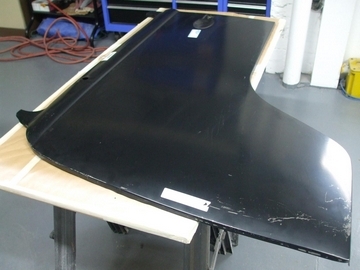 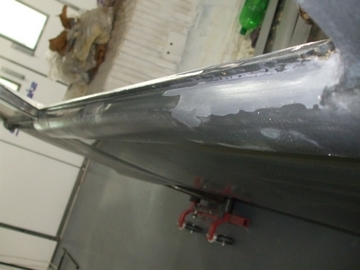 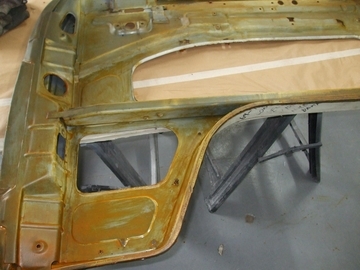 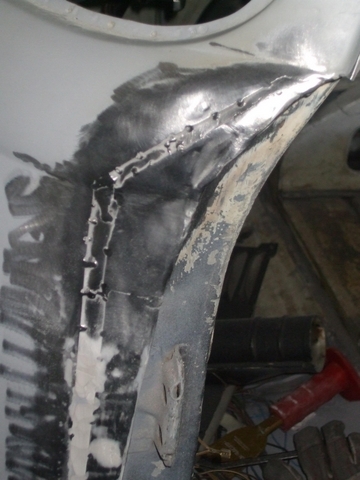 Panels protected with epoxy now ready for repairing! 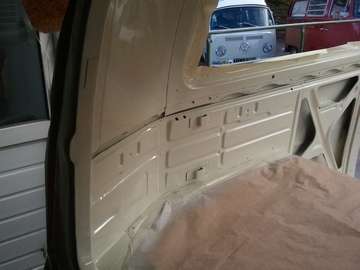 Inside rubbed down by hand, blisters to prove. 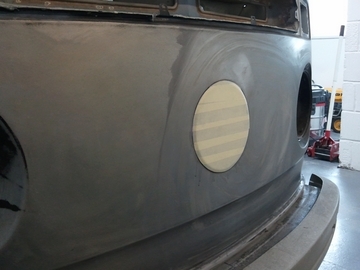 And ahead with the 2k primer. 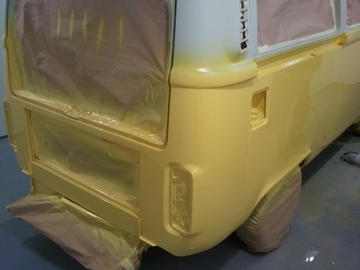 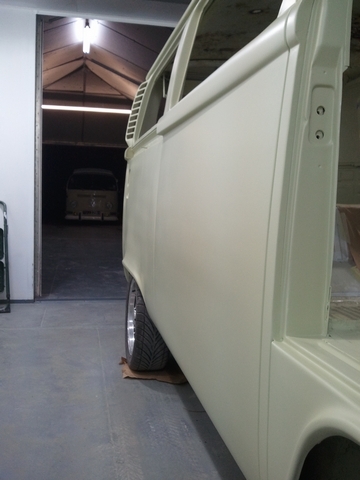 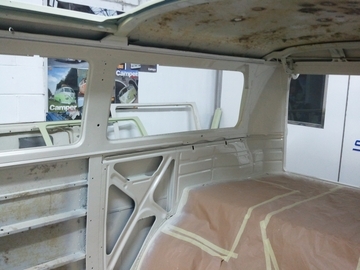 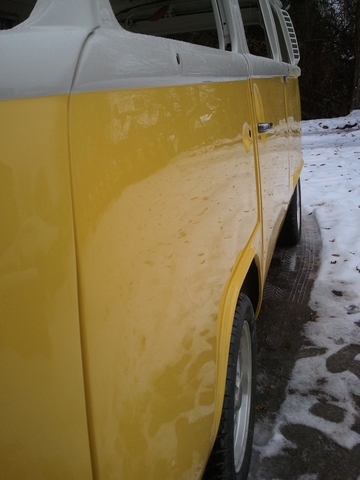 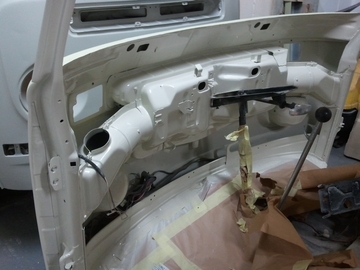 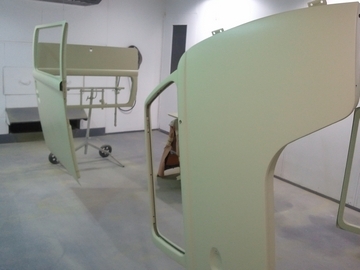 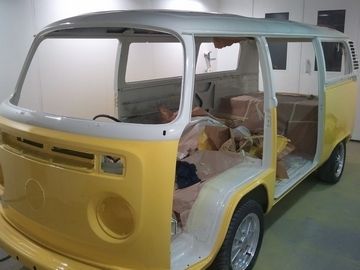 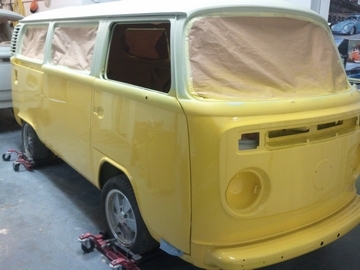 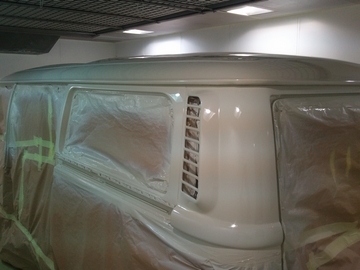 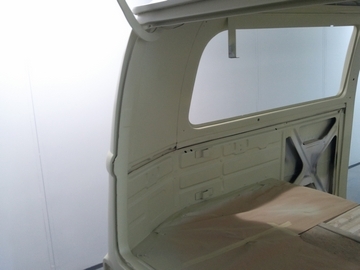 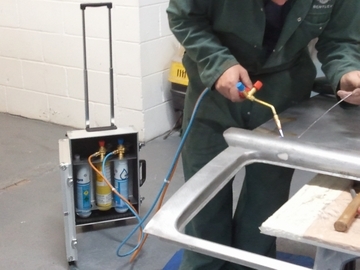 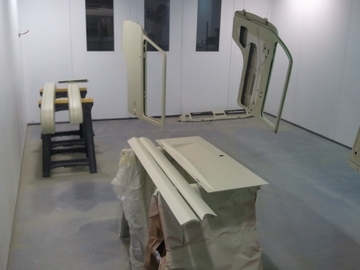 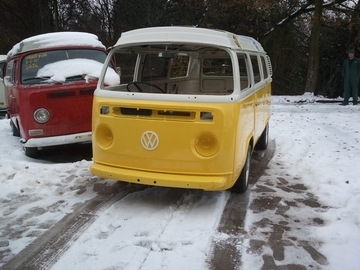 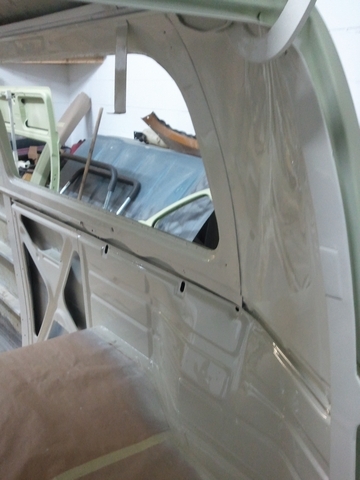 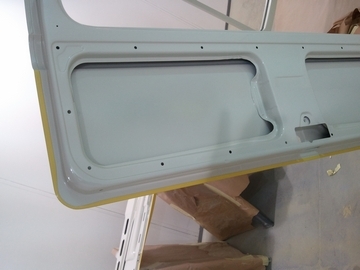 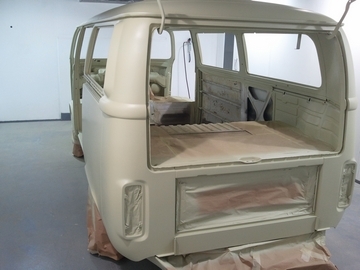 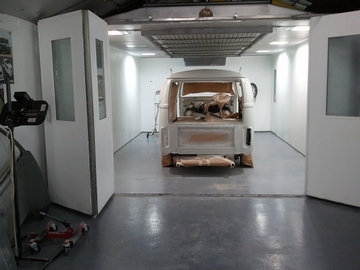 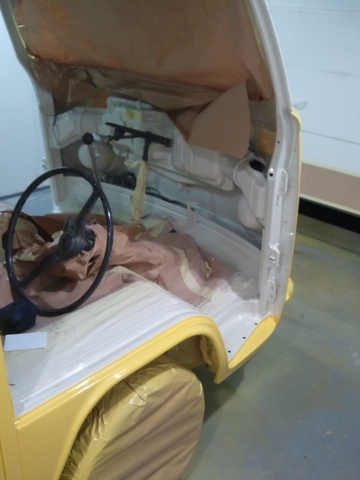 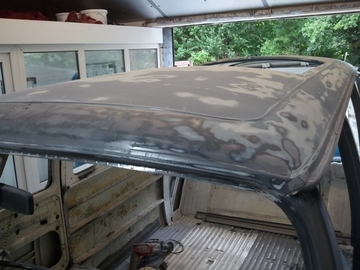 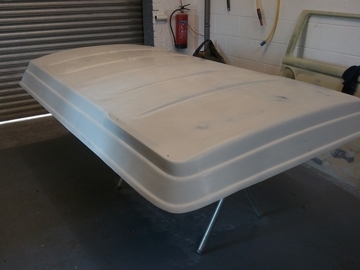 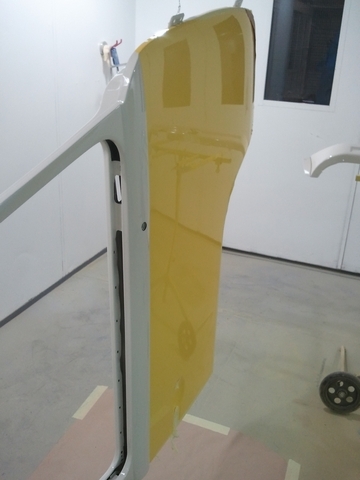 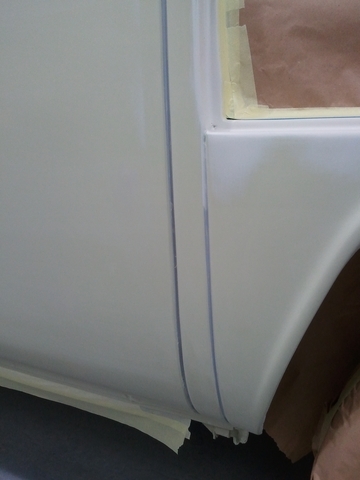 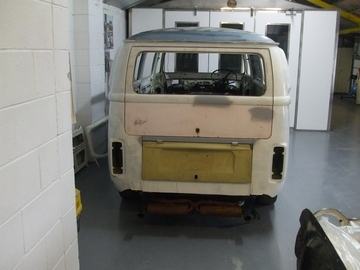 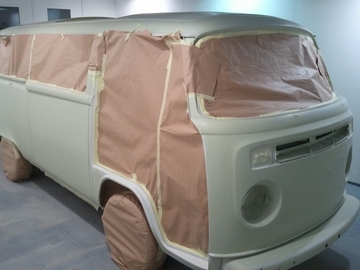 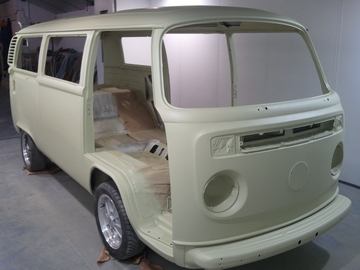 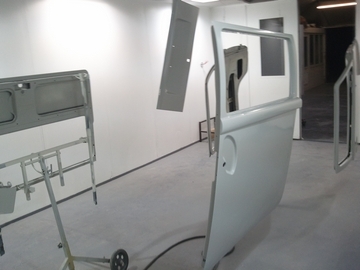 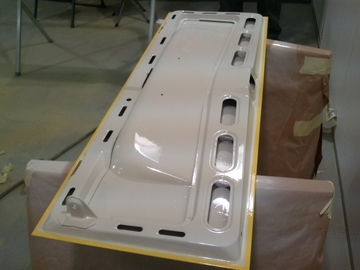 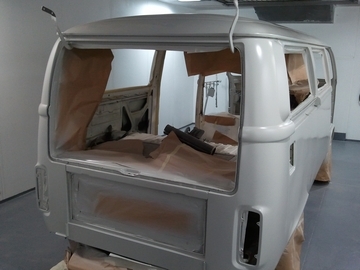 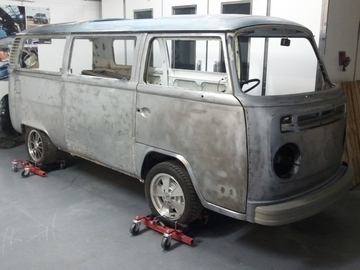 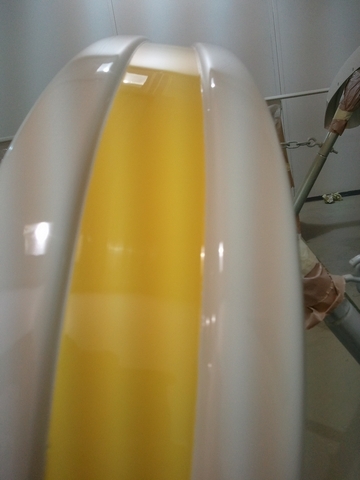 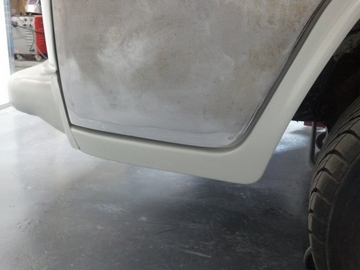 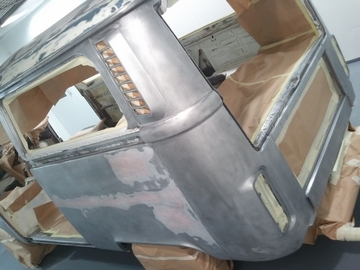 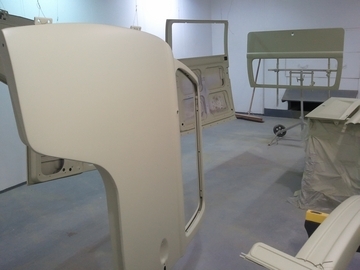 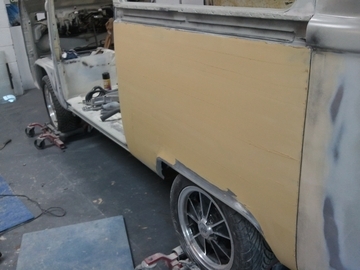 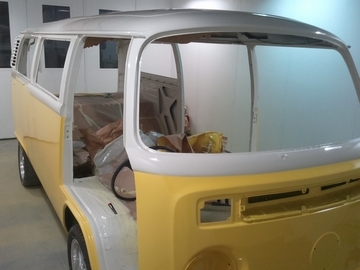 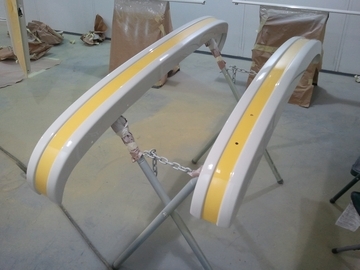 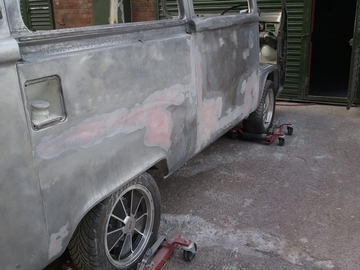 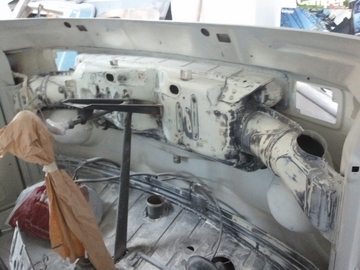 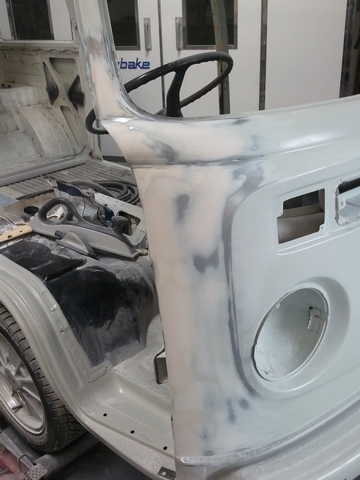 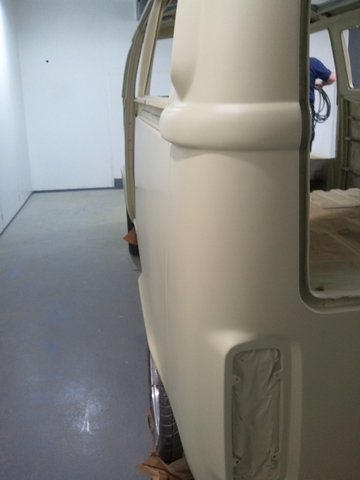 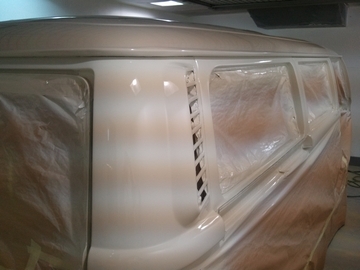 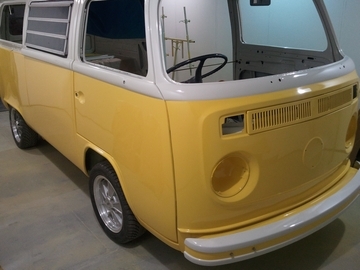 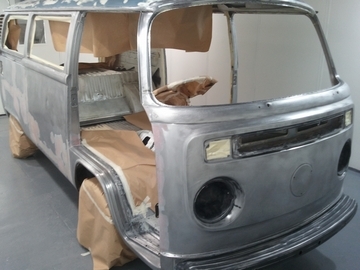 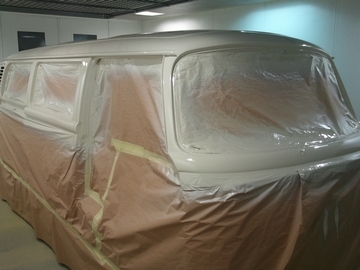 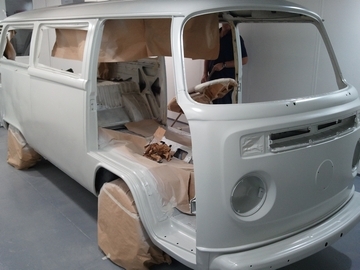 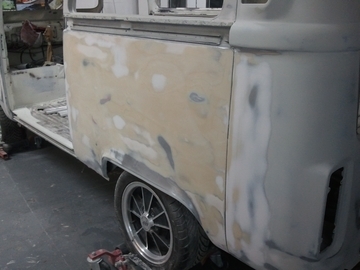 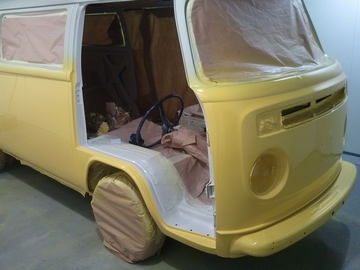 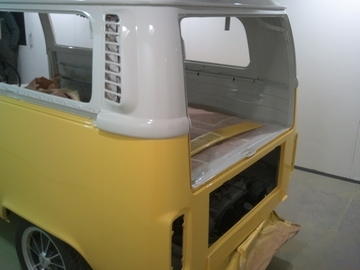 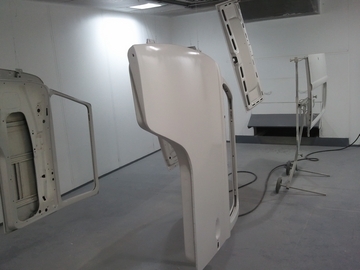 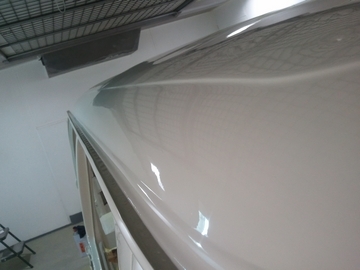 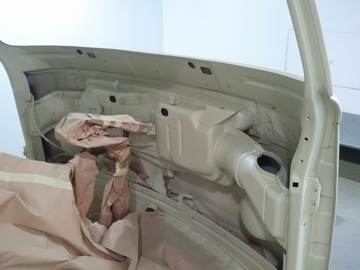 Here we have started to coat the insides in pastel white, stated for the year of this vehicle, however we decided that this would not work with the yellow and changed to VW cloud white. 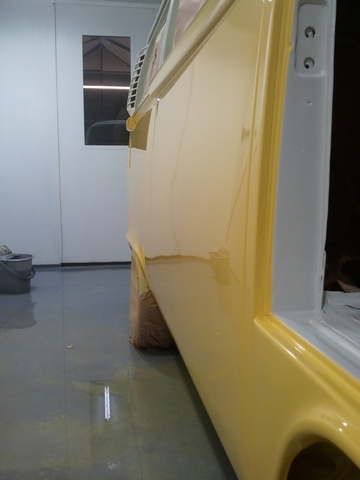 What a fantastic job -you guys know your stuff. 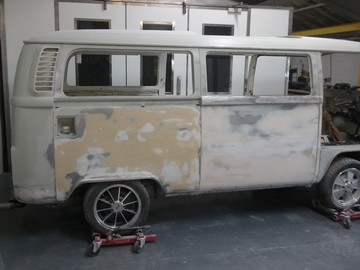 I can`t wait to see the finished job!